I have written about how amorphous the scoping process for Metro and Caltran’s 710 gap-closure/ big dig project has been. I’ve now given shape to my own opinions in comments for the scoping phase of their environmental review (which ends on April 14th). Please submit comments if you are interested in the future of freeways and transportaiton in the region. Others interested in this project are submitting comments focused on the proper scope of environmental review of a mega tunnel. So I’m focusing on how the agencies should study and fund alternative mobility projects in the project area and remove, rather than expand, a portion of SR-710. 1. Remove the SR-710 freeway between the 10 freeway and Valley blvd by transforming it into a boulevard and/ or a linear park. 3. Create complete, living and green streets that promote safe walking and cycling and create vibrant public spaces. 4. Reduce freight truck traffic and pollution by expanding on dock rail at the Ports of Los Angeles and Long Beach. 5. Conduct a health impact assessment of all alternatives. I believe that investing in these alternatives would better meet the goals “to relieve congestion and improve mobility within the project area” than would a freeway tunnel. Caltrans and Metro have defined the project area as the geography touched by the five fingers of the potential corridor zones chosen for the Tunnel Technical Study. (See Initial Study Area map). It includes the 5 and 2 freeways to the west, the 210 to the north, the 605 to the east, and the 10 to the south. The west San Gabriel Valley, Northeast Los Angeles, Pasadena, Glendale, and other cities and communities along the Arroyo Seco corridor are diverse, with a rich cultural history and important natural landscapes. The opening of the Metro Gold Line has provided a new sense of connection between some of these communities and opportunities for transit-oriented development and more sustainable land use in the region. The zone is also divided and surrounded by numerous freeways, that bring deadly particulate pollution. They promote car-centric land use and mobility, which have contributed to epidemics of obesity and diet-related illness. The construction of these freeways disrupted communities, especially low income communities of color. Metro and Caltrans have a choice to make in investing billions of dollars to address mobility and congestion in this area. They can look to the past, to early-mid 20th century freeway plans, by extending SR-710 to the 210 (or to Del Mar Blvd in Pasadena) via a surface or tunnel route. This backwards-looking approach (see 1958 map of the massive and thankfully never fully implemented freeway and expressway system), would further pollute and divide communities. These plans are from an era when the car was supposed to solve all mobility challenges. 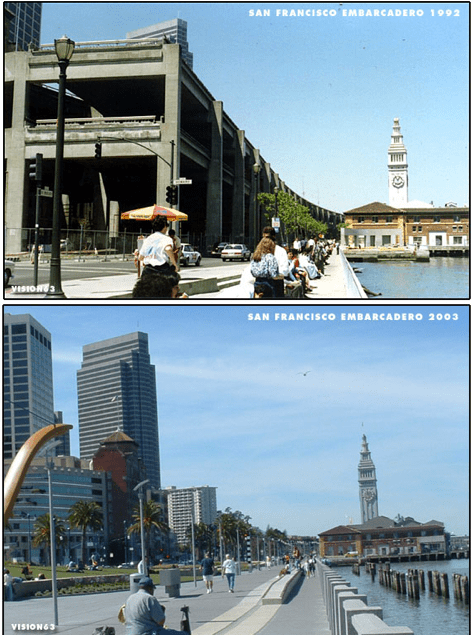 They are outdated relics from a period before scientists understood the health risks of particulate pollution and the threat of climate change; and before planners and health officials fully understood that a freeway and car-based transportation system would lead to sprawl, sedentary lifestyles, and inefficient land use patterns. Or the agencies can adopt 21st century transportation solutions to move people and products in a way that improves the environment and surrounding communities. 1. Remove the SR-710 freeway between the 10 freeway and Valley blvd by transforming it into a boulevard street and/ or a linear park. The approximately mile-long stub of SR-710 that extends north of the 10 freeway to Valley blvd is a promising candidate for removal and transformation. Þ Caltrans and Metro should decommission this section of SR-710 and transform it into a non-grade-separated, complete, living and green street as discussed above and/or into a park and open space. Þ The agencies should conduct a community planning exercise involving residents, municipalities, and adjacent California State University Los Angeles to determine how to best transform the removed section freeway. To limit exposure to freeway pollution, the lower 1500-2000 feet of the new boulevard/ park could be a buffer zone/ ecological remediation zone with more active uses in the northern two-thirds of the site. Þ The agencies should ensure that this closure does not worsen pollution in adjacent communities. This can be accomplished by increasing transit, reducing truck freight trips, and conducting a health impact assessment. Rapidly expanding the transit network in the area under review is the best way to ultimately reduce passenger car traffic and improve denser, walkable land uses. There are significant gaps in transit in the area under review, especially north-south between the northern and southern sections of the San Gabriel Valley and between Northeast Los Angeles and Glendale and the San Fernando Valley. Glendale is in fact the most populous city in Los Angeles County without a light rail connection. Þ Accelerate extending the Gold Line eastwards as planned in the Foothill extension and Eastside extension. Þ Extend metrorail northwest from one of the Pasadena Gold Line stations through Eagle Rock, Glendale and Burbank to the Burbank airport then south to connect to the terminus of the Red Line in North Hollywood. Þ Create metrorail, metroliner or dedicated busway north-south corridors between the two arms of the Goldline. One could follow Atlantic and Huntington to connect the East L.A. civic center station to the planned Gold Line foothill extension station in Arcadia. As the foothill extension and eastside extensions of the Gold Line continues, Metro should consider further North-South Spurs every 3-5 miles similar to the East Valley north south corridors being studied in the San Fernando Valley. 3. Create complete, living, and green streets that promote safe walking and cycling and create vibrant public spaces. Streets let people move between places. Streets are also important public space in themselves. Throughout much of the 20th century, traffic engineers designed wide streets with wide lanes and high speed limits in an effort to maximize the flow of cars per hour at peak traffic times. These design standards created streets that are dangerous to walk or bike on. Streets designed as ‘sewers for cars’ also harm the places they are supposed to connect by making it unpleasant to be outside due to the speed and noise and sterile visual environment of streets. Fortunately, some cities are reinventing streets for the 21st century. These streets are complete in that they dedicate space for all modes of transportation with wide sidewalks, bike lanes (including protected or separated bike lanes), bus only lanes, flex lanes, modern streetcars, etc. They are living and vibrant because they calm traffic, create more and safer pedestrian crossings, more public plazas and seating, and welcome walkers and bikers who bring life to sidewalks and streets and customers to local business. They are green because they are designed with more shade trees, less blacktop, and with landscaping and permeable surfaces to capture and filter rainwater. The My Figueroa project examining street improvements for South Figueroa St. in Los Angeles is demonstrating possibilities for 21st century streets. The Los Angeles County Department of Public Health is similarly funding development of a model streets manual that incorporates similar goals of living, safe, and complete streets. The project area for the SR-710 ‘gap closure’ project has a number of major streets that are too wide, unpleasant, and unsafe. These could greatly benefit from being made more complete, living, and green. Þ Metro should work with municipalities and the County to ensure that a network of bike lanes, protected bike lanes, bike paths and bike infrastructure is rapidly implemented in the project area, with a goal of rapidly increasing cycling’s mode share of trips. Bike lane projects promote clean, healthy transportation and also create more jobs per dollar invested than road projects. Þ Caltrans and Metro should work with the Ports of Los Angeles and Long Beach to expand capacity for on-dock rail so that imports can be loaded directly onto freight trains, reducing the need for trucks to transport containers to warehouses, inland rail yards, and transloading facilities. Þ Caltrans and Metro should work with the ports to set a target and plan for reduced truck traffic on SR-710. Þ The agencies should work with the ports, railroad companies and regulators to accelerate adoption of electrified and cleaner locomotive technologies and to ensure that increased train facilities and trips do not increase negative health impacts. Exposure to traffic-related air pollution is also associated with higher rates of heart disease and cancer in adults. (Kramer et al. 2010. Traffic-related air pollution and incident type 2 diabetes: Results from the SALIA cohort study. Environmental Health Perspectives http://dx.doi.org/10.1289/ehp.0901689; Beelen, et al. “Long-Term Exposure to Traffic-Related Air Pollution and Lung Cancer Risk.” Epidemiology 19 (5): 702-710 (2008); Kan et al, “Traffic exposure and lung function in adults: the Atherosclerosis Risk in Communities study.” Thorax 2007 62: 873-879 (2007). Þ In addition to EIR/EIS, Caltrans and Metro should conduct a health impact assessment of all project alternatives, including the surface freeway, tunnel and other alternatives. 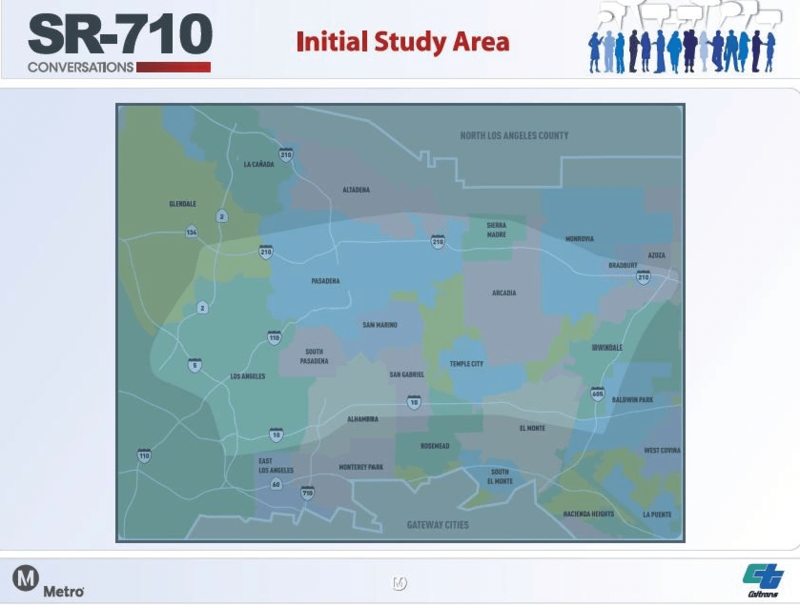 Þ The agencies should learn from the ongoing Health Impact Assessment of the SR-710 expansion project being performed by Human Impact Partners and ICF International with input from Los Angeles County Department of Public Health. I really like the “chop off the 710 stub” argument! I agree, I do like the chop the 710 argument, by doing this, maybe less demand would go onto Valley and Fremont/Atlantic, which has been killing that area immediately at the end of the 710 for years. I’ve argued extending only to Huntington, but shrinking the 710 could be much more cost effective, if done right (they might want to keep a lane of the freeway for a busway, the 485 bus was using that stub for a while). Comment now! April 14th is the last day for the scoping period.